I drew this piece with Prismacolor Pencils, right after I finished doing the People of Pern book back in 1988. At that time, I did it on a dark magenta paper, and I didn't think it was very successful; so when I scanned it in to the computer to make this print, I changed the paper color to a deep blue. Thank you, Adobe, for making this so easy to do! 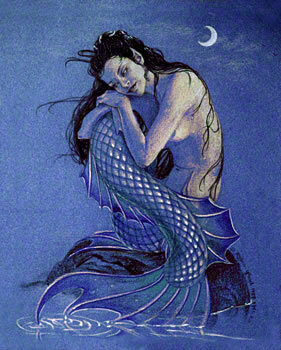 When I did this piece, I was experimenting with the flexibility of a mermaid's tail. So I made it as flexible as I thought I could get away with! And since I was in a tired and reflective mood, I brought that over into the picture, too.